Poached eggs for dinner that are simply delicious and a quick one skillet main course meal from stove to table in minutes. 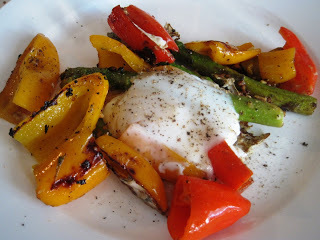 I used fresh asparagus and a variety of sweet peppers for my recipe and the combination turned out fabulous. Ready to put together a nutritious meal in minutes … let’s get cooking! In a large cast iron skillet, or large sauté skillet, place vegetables that have been coated in olive oil into medium hot pan. Allow them to cook to crisp tender and place a small amount of char on the vegetables. Sprinkle spices of your choice all over the vegetables and turn to coat while cooking. Pour ¼ cup water into skillet and cover pan for approximately 5-8 minutes to steam the vegetables slightly. Remove the lid and break 2 eggs over the vegetables, replace the lid, and allow the eggs to poach to soft yolk cook with a nice white skin over the yolk. Remove the lid and sprinkle the egg with black pepper or spice of choice. With a large spatula, place underneath the vegetables and one egg and carefully remove to a plate, repeat with the other egg. Dinner is served!